It was already one in the afternoon but Jennifer’s meeting had ended early and she could now meet for lunch. I was somewhere between downtown and Georgia Tech and she was in Buckhead. Hoping to meet somewhere in the middle, she suggested Nan. After a few quick clicks on OpenTable, a reservation was made for two. Although it’s been a few years since I last ate at Nan, things really haven’t changed inside. The interior is still spacious, elegant, and wonderfully appointed. Oddly enough, I think we sat at the exact same table as last time. Looking through the menu, we immediately noticed a problem; we couldn’t decide on an appetizer. Sure it would have made much more sense to pick one appetizer per person and share, but it was much more fun to order Nan’s Tasting Tree. Featuring almost every item in the appetizer section, it was the perfect solution. 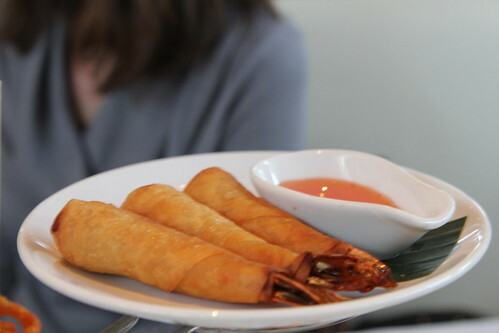 Starting with the Kung Thod or stuffed shrimp, the shrimp may have been a little dry but the skin was crispy and well complimented by the tamarind sauce. Pla Muk Thod, calamari with three chilis sauce was one of my favorites. 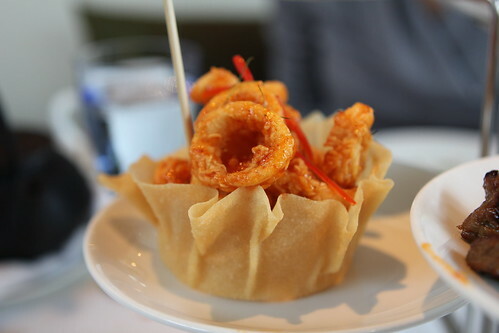 Each piece was crunchy and coated with a delightfully sweet and spicy sauce, if only it was served a little warmer. 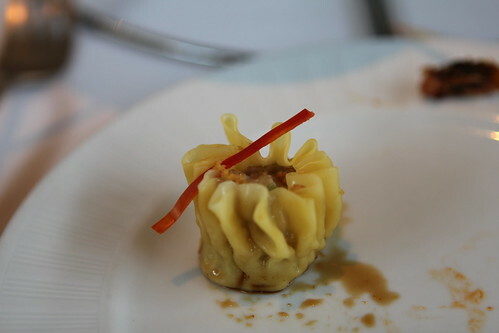 I would describe the Kanon Jeeb Chau Moung, steamed Royal Thai dumplings,as a Thai take on Chinese sui mai. While the dumplings were cold and the wrapped was dried out, there was a well seasoned meat filling. 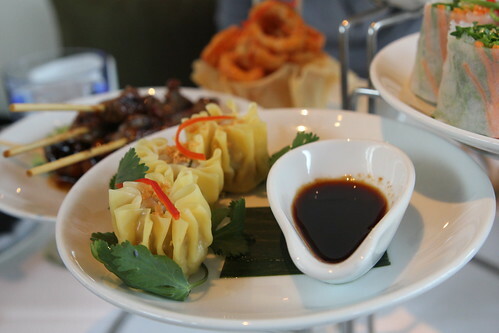 I’m wish I knew why these dumplings and the calamari were the only cold items on the Tasting Tree. 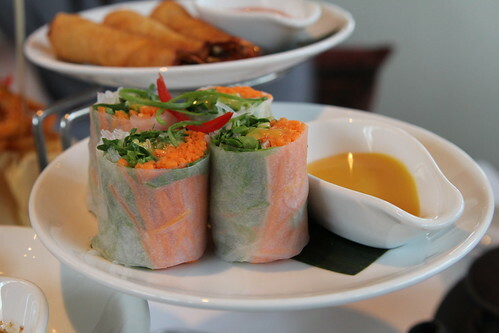 There was another cold dish, but I’m fine when cold spring rolls arrive from the kitchen. 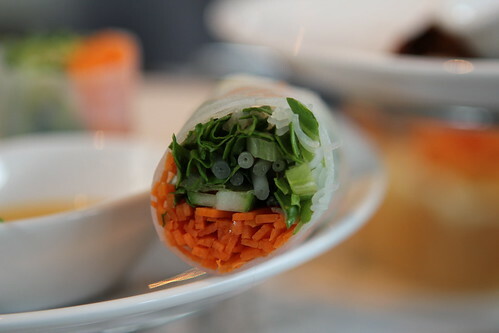 With the forward flavor and crunch of carrots in each bite, these spring rolls were spicy and very well done. 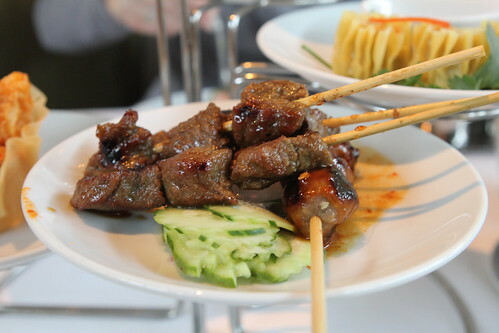 The last part of the Tasting Tree was Nan’s take on the satay. 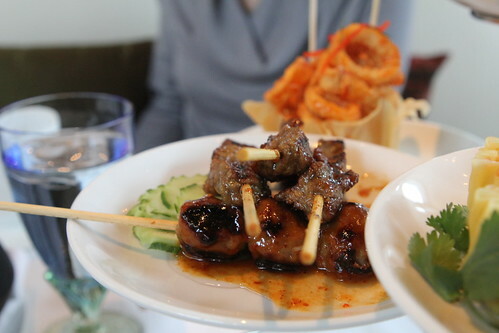 Tender chunks grilled beef and meatballs were a break from the satay norm. The sweet sauce may have worked well with the beef, it was even better with the meatballs. I never need a good excuse for a bowl of soup, but with the weather in the high 40s and rainy, it was the perfect time for a steaming bowl of broth based goodness. 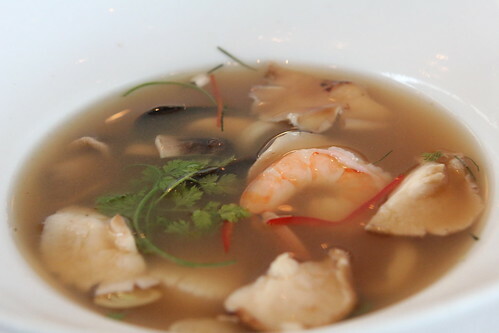 While Nan may only have three soups on their menu, the Tom Yum Talay was just what I was hoping for. One thing I wasn’t expecting was the pungency of this soup. The first spoonful of vinegary broth was disarming, but it quickly became quite delicious. 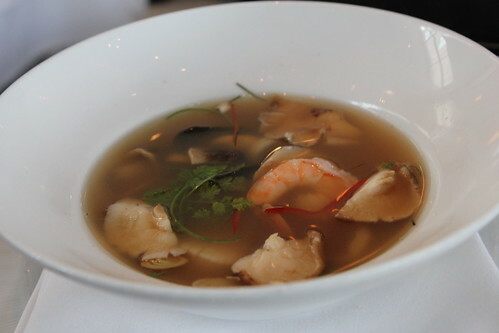 The shrimp were tender and briny, the mushrooms just tender, and the strips of kaffir lime leaves gave just enough of their flavor to each spoonful. Unfortunately, the rest of the seafood was completely overcooked. 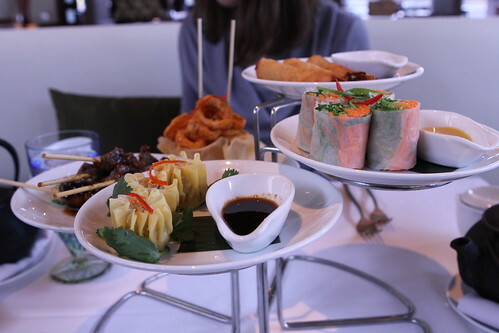 When it came to entrees, Nan left us spoiled for choices. From the pick your curry & pick your protein section to pad thai to the chef’s selections, each entrée was a tantalizing choice but I was drawn Gang Panang Nuea. It’s not often you see short ribs on a Thai menu, so I was curious to see how Nan would handle that cut of beef. Once it arrived, I really couldn’t figure this dish out. Nearly everything about it was delicious. The red curry sauce was wonderfully flavored and complimented the toothsome green beans, but the beef was a different story. The short ribs were fall apart tender but oddly tough and stringy. 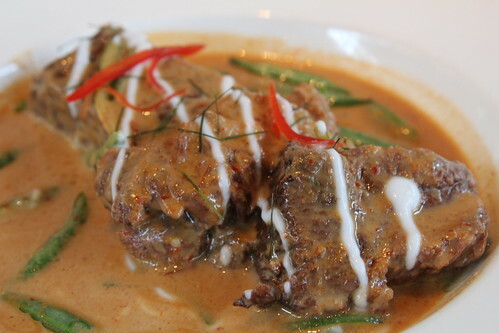 While the ribs were passable with the red curry sauce, it’s hard to justify Nan’s prices for stringy beef. Needless to say this last visit to Nan was a mixed bag. There were some high points: the calamari, the curry sauce, the satay, but they seemed to have missed the mark on others. I like Nan, the décor, the knowledgeable wait staff, the enticing menu, it all makes for an excellent package, but this past meal of cold food and overcooked proteins just doesn’t justify the prices. I’ll probably give Nan another try, but after this meal, it’s not very high on my list.